Because printing is central to the use of the Robinson Curriculum I know a lot of you have questions as to which printer would be best. The good news is that technology is now delivering the ideal printers at a lower cost than ever before. Someone said that the power of the press is for those who own one - and have something worthwhile to print! Your computer, one of these printers, and the Robinson Curriculum give you that power. The main factor to consider when choosing a printer is cost per page since this cost is often more than the cost of the printer in the long run. Paper costs about $20-$30 per 5000 (1/3 to 1/2 cent per sheet which is 2 pages) so this a minor cost. 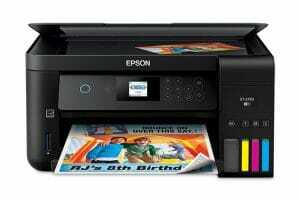 With the new Epson printers the cost per page can be as low as 1/5th of a cent per page. That means a a 300 page book would cost just 60 cents in ink to print. Amazing. * K means 1,000 pages. A 11K toner cartridge is good for 11,000 pages.